Windproofness is it a Requirement of a Wading Jacket or not? Not all fly fishing is done from a boat or structure, not even from the bankside. More than often a need to get into the water where the target species lives is required. Fly fishing in the saltwater flats is a different scenario and one I hope to return to later but for this post I want to go into the requirements of wading in freshwater with a pair of waders and boots. For that we also then need to investigate fly fishing wading jackets to go with these waders. There are a few things to consider when looking at the best fly fishing wading jackets 2019 and below we have listed the main areas to think about when looking to buy. The most important factor in deciding on a wading jacket is the ability to keep you dry when out fly fishing. It seems river or lake fishing comes with the added condition of falling rain. Sometimes it will be light and infrequent others it will be a constant deluge and the fly fishing wading jacket needs to be able to keep you dry and comfortable. There is nothing worse than getting a soaking from a shower to find it seep through your outer shell and onto your inner layers. Feeling wet for long periods of time is not great in warm weather but when its cold it can really cut short your fishing trip. In fact it can be the difference in life or death when is tough weather conditions but lets not go there for now. Gore-tex the market leader in waterproof materials. Not only is it waterproof but it has great breathability features. Gore-tex is currently only available in Simms wading jackets. The technology in these jackets is second to none but very expensive and not within the budget of every fly fishing angler. Gore-tex is in fact a membrane rather than a treatment of the fabric outer shell. Other manufacturers have gone in different directions in waterproofness most working with treatments of the fabric itself. This can be cleaned and re-treated when the pores become blocked whereas Gore-tex is re-energized by lightly ironing the jacket after cleaning with the appropriate cleaning solutions. Although the jacket needs to be waterproof it also needs to be breathable. That is it needs to be able to let moisture released from the body to get away from your skin. Wearing a jacket that is not breathable on a warmish day especially when hiking to a beat or pool will leave you wet from sweat and this again is not comfortable. The introduction of breathable fabrics means this sweat can evaporate away from the body keeping you cool and dry even when hiking. With these types of fabrics there are the good, better and best options. The best keeps you dry in a heavy storm and allows heavy sweating to evaporate quickly. Others will keep you dry but not let your sweat get away quickly enough and can still leave you moist after a hike however this usually drys out after a period of time if you are wearing the correct base underlayers. The ideal layering system allows moisture to wick away from the body and out to the outer layer of the fabric. This may have to go through several layers especially in winter when extra fleeces are added for warmth. The base layer next to the skin needs to be snug ideally touching the skin all over so the moisture can travel directly through it away from the skin. In summer this process, evaporative cooling, can actually keep you cool and comfortable. Your cotton t-shirt will not give you this effect in fact cotton become damp and will make you feel cold. Base layers need to be made from polyester or fine Merino wool. The polyester is the cheaper option but works well, it can get a bit smelly after a bit if not cleaned using a good anti bacterial wash. The Merino wool is very soft and nice to the touch and usually odourless a bit more expensive than polyester but well worth it. The mid layer is required to trap air between the outer shell and the base layer this air stays warm and keep you comfortable in colder days. The ability for this layer to trap air will decide the colder the day you can stay out in. Microfleece is one such mid layer and as it comes in different thicknesses can be adjusted to allow for the correct temperature requirements. You can indeed have several fleeces built together a light fleece under a heavier one is ideal on really cold morning starts then the heavier one can be removed as the day warms up and again added at the end of the day as the sun’s strength fades. It’s much better to have extra layers available and decide which is required than be cold on a days fishing because you didn’t wear the correct level. Other mid layers are heavy Merino wool and duck down garments. Merino as in the base layer is natural and a great mid layer garment. The down garments are becoming more obtainable and designed in different weights to help keep warmth in. Weight for weight its the best but must be kept dry. If your out shell is weak then this garment will also let you down as moisture comes at it from both directions. It will wick moisture away however if the outer shell is intact and keeping water tight. Wind travelling through a garment will chill you quickly especially if you are already slightly damp. A true windproof garment must only allow less than 1.0 cfm of air to pass through a square foot per minute. Not many garments can manage this however the gore-tex membrane has been developed to withstand this level. As a requirement for wading the need to stop wind blowing through you on a river can mean the difference in fishing on or going home after a few hours froze to the core. You can achieve a similar effect with a few layers and some tightly woven fleeces however if the top layer is windproof you are golden. Due to the requirements of wading jackets in that you are wading in water they are designed to be short. Most will only come down as far as the top of your waist. Depending on how deep you intend to wade you can get a jacket to suit your wading depth. Not many anglers feel safe wading past their waists especially in water they are not accustomed too. However there are a few who go to nearly the top of the chest wader and in so get the jacket wet anyway. Wading jackets that are dipped in the river will usually dry very quickly and usually the pockets will be high enough to keep your belongings out of harms way. The jacket should have enough room in the arms to allow casting freely, if they are too tight they will restrict your swing and put off the cast. Most manufacturers allow for this. Also a bit of room to allow additional clothing underneath is beneficial for fleeces or thinker base layers if the weather requires it. Again a jacket too tight will restrict your movement. In some cases going up an extra size will cure the problem. The wading jacket should also have cuffs you can tighten well to keep the water from running up your arms when casting especially prone when performing a spey cast.at the top of the cast when the arm is up overhead water will run off the rod and hands into the jacket. Do this for a few hours and you will be soaking. Better to have a jacket where the cuff can be velcroed tight to keep most of the water out. A good option on the wading jacket is the size and number of pockets. I like to travel lite so I put my spare fly lines, fly boxes and tippet into my pockets. Some fly anglers like to use the fly fishing vest and it’s a great option when the weather is fine but if you are expecting rain the wading jacket is the better option and one with decent pockets is beneficial. Size and shape of the hood is also a consideration to think about. Hoods that are too big and cover too much of your head will hinder sight and the ability to spot fish and cast to them. A lot of the better jackets have a drawstring on the hood to make it fit your head size. Another good benefit is to have a nice peak at the front this is also helpful for sight, however the use of a baseball cap can achieve the same effect. Some jackets will offer fleece or other soft materials around the neck to keep you comfortable during the day as all that swinging arms and head can leave you with a rash if the neck is too tight. The last option is attachment locations. There are points on the jacket where you can attach zingers, landing net and tools like forceps. A D loop on the back is great for hanging a landing net and and a couple of brands have zingers built into the jacket to attach your tools. You can always pin a zinger onto a jacket but it’s more stable if the jacket offers one or two and you will not puncture it adding new ones keeping the integrity of the jacket intact. Wading jackets in this category generally have better waterproof membranes and layered to help keep the warmth in and hold up to the rough and tough from vegetation. They are usually better finished and made to last. Jackets in this category will have goretex or similar top membranes that will keep you dry in the most terrible of weather. Guides and Guilies will buy wading jackets in this category as they spend so much of their time on the water and need a jacket to hold up to the conditions. Speaking to many guides they say they get value for money as they will spend much more on replacing cheaper jackets throughout the season than in buying a top brand from the start. A good point but not in everyones budget so rather than just talk about the high end wading jackets I have put together a list of some of the best in several price categories to help anglers from different backgrounds and budgets. Shopping for the best wading jacket can be hectic due to the many brands available in the market. Keep in mind that not every piece of fabric in these stores is original, high quality and durable. In fact, counterfeit jackets have flooded the market the past few years. When you spot Simms G4 Pro Wading Jacket be sure to pick it for its authenticity and high performance. You will love its weatherproof features. – Nylon is 100% weatherproof protecting you from the effects of adverse weather. The three-layer fabric construction makes the jacket comfortable and warm to wear. Breathability is enhanced by the mesh material in the inside part of the jacket allowing free air circulation. – Zippers are water resistant and made using the YKK VISIONARY Aquaguard technology. – 9 pockets on the jacket are spacious to accommodate fly boxes, accessories and all your valuables. On the chest area are two bellowed pockets and two zippered pockets. Other pockets are 1 inner pocket, 1 tippet pocket, 1 sleeve pocket and 1 back pocket that is large enough to store your fishing net and other accessories. – The hood is big enough to cover your entire head, forehead and cheek areas. To make it fit, it comes with three adjustment points. If you feel like airing your head, you can tuck it away. – Cuffs are fitting and weather resistant to keep your arms dry and warm. – The bottom hem is fitted with a dual draw-cord. This cord is for adjusting the waist area of your jacket to any tension you feel is comfortable. – Find this Simms G4 Pro Wading Jacket in small, medium, large, extra-large and double-extra-large size. Simms ensures that its wading gear is made from high-grade material to ensure they are durable. For a longer lasting experience with this Simms G4 Pro Wading Jacket, ensure you maintain it by following the cleaning and laundering instructions on the tag found on the inner back side of the jacket. Doing this will save you extra cost of purchasing a new jacket each year. Normally, the weather is unpredictable but we feel like spending time outdoors. Without the best protective gear, we may end up getting a soaking. Simms minds your health that is why its Simms G3 Guide Wading Jacket is artistically crafted to suit all your needs while outside. From the high-grade polyester material, it is made of, count on its durability and continuous selfless service. – Nylon material is 100% water and windproof. The GORE-TEX technology is used to design the three-layered fabric to add to the jacket’s thermal properties. Wading in the coldest waters shouldn’t get you worried. The interior side of this jacket is made of breathable material for easy air movement during all seasons. No feeling stuffy. – Storage pockets, seven in number, are large and spacious to accommodate all your essentials and valuables. Organizing becomes easier. Two main pockets are in the chest area. One on each side. A zippered pocket is on each main pocket. One stash pocket in the interior and two micro fleece hand-warmer pockets accessed via zippers to keep your hands warm when not engaged. – Cuffs are waterproof and keep your sleeves dry. – The storm hood is big and can be adjusted to three points depending on how fitting you want it. In case you want your head out for a few minutes, tuck the hood away to avoid it getting into your way. – On the bottom hem is a dual draw-cord that can be adjusted to prevent elements of weather from slipping into your jacket to your upper body. – All zippers are made in the YKK Aquaguard design making them completely weather resistant. The frontal zipper that runs from the bottom of the jacket to the neck area allows your chest to be fully covered and protected from the effects of weather elements. Zippers accessing the pockets protect all their contents from destruction by water. If a light jacket that is comfortable and the best to have when fly fishing then the Simms G3 Guide Wading Jacket is just what you need. You will love its durability and excellent weatherproof performance. Great health is great wealth. Sometimes the state of our health depends on the weather and seasons. To beat all orders and remain in good shape especially if you are a mariner, sportsman or an angler, investing in the Simms Guide Wading Jacket is the best option you can take. Not for its looks only but mostly its protection properties that are incredible. – Nylon material used is 100% water and windproof. The GORE-TEX shell technology employed on the fabric makes it breathable allowing free air circulation especially when it is hot and you are sweating. – Gore-tex is also windproof so you can stay out in conditions that will force other anglers inside. – YKK Aquaguard zippers are strong and have tags to help you open and close with ease. The frontal zipper is reinforced with a storm flap that is weather resistant to ensure your chest area is fully covered, dry and warm. – The storm hood can be tucked away if not in use. It almost covers your entire head and face which is a good thing. You can adjust it at three points to perfectly fit you. – Storage pockets on the chest area-one on the left and the other on the right are big and spacious to accommodate fly boxes, valuables and other accessories you need for fly fishing. The pockets are covered with storm flaps for more protection of your items. Integrated retractors keep off water and wind. – Shingle cuffs on the wrist areas are watertight and you don’t need to worry about getting wet. -The waist area, on the hem, is fitted with dual adjustable cords that allow you to fasten your jackets to whichever tension that is comfortable. Just because you are in contact with water doesn’t mean you don’t have to care for your jackets. Cleaning and maintenance are easy. You are required to wash with very mild detergent to avoid peeling the Simms Guide Wading Jacket and extending its lifespan. Avoid using bleach and fabric softener. Heeding to the manufacturer’s instructions on the tag of the jacket is important for a long-lasting effect. Do you want to look like a pro? Wear like a pro. Orvis loves to raise your standards by providing you with epic sporting wear that will make your friends envious. Orvis Pro Wading Jacket makes you look classy while still in style at the shores. Outdoor conditions can get tough and unbearable but you can get through this with Orvis Pro. -Polyester material is 100% waterproof, breathability and dryness is its purpose. This material is easily washable in case you get dirty with mud. The shell fabric has three layers that are custom woven to retain heat and keep you warm in winter. -Seams are fully taped and sealed to prevent water or cold from slipping through. -The back yoke has a D-ring that allows anglers to attach their nets relieving you of burdens in your hands also a two front attachment points at the top of each front pocket and a fly patch on top left. -Storm hood is designed in a three-way adjustable manner and has a laminated brim to prevent your head area from feeling cold and contacting water. -The hem is adjustable and allows you to modify the tension you feel around your waist. -Chin guard integrated on the hood is finely brushed with suede to boost temperature levels and add to comfort. -Orvis Pro Wading Jacket has six pockets. Two chest bellow pockets, two on both sides with hand warmers, an internal security pocket and an internal mesh pocket. They are spacious enough to hold fly boxes and other small accessories you need while fly fishing. All pockets are lined with hand warmers for comfort and warmth. -All zips, YKK Aquaguard is water resistant and side zips allow free air circulation and easy accessibility to waders. On the inside, the interior security pockets are zippered and have power mesh. -Dolphin Skin cuffs are water resistant and keep you dry when you land and release fish. -Sizes available are small, medium, large, extra-large and double-extra-large. Feel free and light with Orvis Pro Wading Jacket on. One feature you will love is the presence of the D-ring at the rear for attaching your net and the spacious storage pocket to keep in your fly boxes. No luggage, no baggage. Anglers who find fly fishing a thing for life will tell you that bad weather doesn’t exist-only bad gear. They are right. 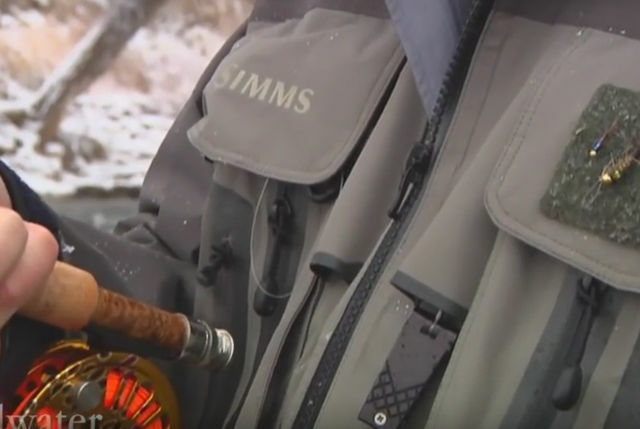 Simms makes sure that you can beat the ‘bad’ weather and enjoy fly fishing. The jacket is built with class and you will need to spend more to have one. The jacket has a three-layer GORE-TEX construction to keep you warm in all seasons. Breathability and waterproofness ensure you are dry and this technology makes the jacket durable. YKK zippers are water resistant and function well. They do not rust or get corroded when exposed to water or other elements that can affect it. The main zipper protects your chest area which is more vulnerable to the effects of cold. Six pockets are enough to store your items and if you are not a heavy packer, you can have everything you need in the jacket. Two chest pockets have zippers and can be used to carry your fly boxes. The inner side has a stretch woven pocket which you can put your valuable items like jewelry, cash, cards, keys and phone. Two hand warmer pockets for your hands when free and a big storage pocket at the back to store your fishing gear or your lunch box. Shingle cuffs are watertight and prevent water or cold from going up the sleeves. Its hood is spacious and adjustable to keep your head protected from the wind. The wind cutting collar is a great feature to cover your upper chest and neck area. If you have a small-sized head, it reaches your chin. Available sizes are extra-small, small, medium, large and extra-large. Proper care and maintenance is important for durability. Care instructions are indicated on the Simms website and should be strictly followed. You wouldn’t want to lose such a high-end jacket to ignorance. Women in their nature love to be classy and out in style, more often they follow fashion trends and would love to be at per with what is in the current market. Orvis takes this into its plans and designs the Orvis Womens Pro Wading Jacket. Female anglers can now look glam even in the water. How well this jacket is designed is what makes women love it. -Polyester material used is 100% waterproof. The jacket is customized and the three-layer shell is woven to retain body heat. The 20,000 waterproofness and 15,000 Breathability adds to its durability. -Seams are completely taped for aesthetics and weatherproofing. -The storm hood is made in a three-way design to accommodate any hair additions fully. It is adjustable and has a laminated brim. -YKK Aquaguard zippers are water resistant to prevent water from slipping through. The frontal zip runs from the bottom of the jacket to the upper neck. -Dolphin Skin CU system is integrated into the polyester material to boost its weatherproofing properties. -Pockets on the Orvis Womens Wading Jacket are vertically sewn in. The two pockets are spacious to accommodate fly boxes and have zippers to prevent water from damaging your items. All pockets are lined with hand warmers that add to comfort. -The chin guard on the hood is brushed with micro-suede to keep your head area warm. Side zips on the jacket are for ventilation in case it gets hotter and give women anglers easy access to waders. -Tabs on the jacket are made of rubber and are for tool docking. -The inner side of the jacket has a security pocket with zippers to keep your small valuables. An internal power mesh pocket can be used to store more items like keys. -The D-ring rear yoke can be used to attach your fishing net. -Sizes are available in extra small, small, medium, large and extra-large. Looking gorgeous while fly fishing is something all women anglers should consider. The wading jacket is washable and this feature is something you will love because of its convenience. Jack is a dull boy without play. Don’t be like him. Go out and have fun but in the right gear. Patagonia River Wading Jacket is all you need in your sports bag. Designed to cater for all your protective needs, you are sure to remain dry and warm even in a storm. Those with cold allergies or ailments aggravated by cold shouldn’t hold back their urge to go out. As long as you have this all-weather jacket, stomp out like never before. – Polyester material used is 100% water and windproof. Designed with twill infused microfiber, this jacket has a very high breathability rate for free air circulation especially during summer when you sweat a lot. – Four-layer construction makes this jacket durable and warmer. The durable water repellent finish makes a water slide off rapidly. – Three pockets on the outer side, two main pockets are large enough to accommodate fly boxes and other accessories and are accessed via zippers. One pocket on each side. On the right side, the pocket is a smaller pocket with a zipper. The interior side has a security pocket to keep in your valuables. A mesh pocket is on the inner right side to offer more storage space. – The frontal zipper is strong enough and prevents entry of water and cold to your chest. – Cuffs are adjustable and weather resistant to keep your arms all dry and warm by keeping off weather elements like the cold. – The bottom hem is fitted with durable draw-cords to allow you adjust the waistline to the tension you feel is comfortable. – Storm hood is big enough to cover your head area. The neck of the jacket is elongated to protect your neck region and chin area from cold. On the neck extension are press buttons that close with those on the hood to ensure it fits better and doesn’t blow off when on a high-speed boat. – Available in ash tan color, you can get this jacket in small, medium, large, extra-large and double-extra-large sizes. There has been a great evolution in how men think about their appearance. Especially sportsmen. Men love to be associated with class and executive features and the Patagonia Tough Puff Wading jacket will never disappoint. This jacket is striking yet having exemplary service delivery due to its outstanding weatherproof features that you will love. If your hubby loves to go fly fishing, this is the perfect birthday gift to give him. Stylish and affordable. – Polyester as the main material used in manufacturing is water repellent and windproof leaving you dry and warm. The mechanical stretch feature is a feature you will appreciate. You don’t have to give away the jacket in case you start puffing up. The 2.5-layer construction adds to the thermal properties of this jacket. Breathability is made possible from the mesh fabric on the interior side. The durable water repellent finish adds to its weatherproof feature. – Two pockets on the chest area are large and spacious to accommodate your fly boxes and other small sporting items you need. Two other hand-warmer pockets are lined with fleece to make your hands warm when not busy. All these pockets are accessed via high-quality zippers. -Cuffs are highly elastic to keep your wrist and arms dry and warm by preventing weather elements from slipping through and causing discomfort. – The storm hood has an elastic band to make it fit each time you put it on. Whether bending back or forth, it can’t get off. – All zippers are durable and water resistant. The main frontal zipper protects your chest from cold and the zippers on the pockets keep your items free from damage by water and mud. – Available colors are in black and bay blue. Sizes range from small, medium, large, extra-large to double-extra-large. – Good on moist days but better with a outer light waterproof jacket on really wet days. Purchasing the best wading jacket doesn’t have to cost you an arm and a leg. Patagonia Tough Puff Wading jacket is affordable and performs its protective functions extremely well. Despite being lightweight, it is stretchy to allow you put it on even if you are speedily adding weight. Simms has been in existence providing sportsmen with the unique and high-quality gear needed to make their outdoor activities fun and comfortable. That is witnessed in the craftsmanship done on the Simms Freestone Wading Jacket. The fabric is engineered with a heavy duty membrane that is highly water resistant yet providing warmth and dryness to its wearer. The two-layered coated fabric adds to its thermal properties. – Material used 3‐layer Toray® nylon with tricot backer is 100% water resistant and windproof. Your chest area is safe with the double layered fabric that retains body heat keeping you warm in both summer and winter. Nylon is easily washable and dries very fast. Only mild detergent should be used for laundering. Avoid bleaching agents and fabric softeners that can wear out the jacket membrane. Mesh fabric in the interior parts is highly breathable to allow free air circulation. – All zippers are made in the YKK-Aquaguard design making them totally weatherproof. The center frontal zip running from the bottom to the top is reinforced with a storm flap. – The storm hood can be adjusted at three points for more comfort. If you feel your head needs to be out, you can tuck it away. – Two pockets-one on each side are spacious to accommodate the largest fly boxes and other valuables. Pockets are accessed via water-resistant zippers and are further reinforced with storm flaps. – The integrated retractors repel water and wind. The interior parts of the pockets are lined with fleece to increase heat retention abilities making your hands warm. – The lower hem is fully closed without shock cords. This still doesn’t easily allow water and cold to easily pass through. – All seams are completely taped for a good look and t add to the jackets weatherproofing properties. – A D-ring is attached to the jacket for net attachment and one fly patch to place your fly rods when not in use. – The molded cuff tab that is an anti-line catch is strong enough to prevent you from snagging. Simms Freestone Wading Jacket is comfortable enough and its weatherproof ability is a feature you will love because you stay dry and warm throughout your fly fishing sessions. In as much as water is fun to play in, it can get dangerous at times. That is why you need maximum protection every time you go out fly fishing. Having an Aquaz Trinity Wading Jacket handy is the best thing to do. Your upper body is safe from weather elements that can make you sick. It is durable too so you don’t have to be worried about replacing it any time soon. -Polyester material is 100% waterproof and the fabric is woven in three layers to provide enough warmth during all seasons. Its breathability rate is high to allow proper ventilation. -Two chest pockets-one on each side are large and spacious to accommodate fly boxes and other accessories you need while fly fishing. Two side chest packet have the inner side lined for hand warming. Two small front zippered pockets will hold valuables. At the rear side is a big cargo pocket that is easily accessible without removing the jacket. Inside the left chest pocket is an accessory pocket with a zipper. -YKK Aquaguard zippers are all weather resistant. Two short sized zippers are in the pockets while the longer frontal zipper runs from the bottom of the jacket to the neck area. -Five D-rings are built in the jacket for you to hook in your nets, floatants, zingers and other items that you need to access quickly. -The wrist cuff system is adjustable and made with a Velcro closure that is weather resistant. -This jacket you can get in small, medium, large, extra-large and double-extra large sizes. -The storm hood is big enough and adjustable. It rolls easily and snaps over the collar to protect your head and cheek area from the wind, cold and water. -At the waist, a shock cord is fitted to adjust your jacket to any tension-whether tight fitting or loose. Aquaz Trinity Wading Jacket has all the features that make a jacket suitable for wading. Your chest area and upper body need protection when in water to prevent cold-related illnesses like pneumonia. The three-layer design is a feature that will make you get this particular jacket because of the amount of warmth it retains. Anglers and sportsmen must have heard of the prowess Patagonia brags off when it comes to their gear. Trust their jackets to be of extremely high quality and excellent performance. Favoring your health by offering maximum protection to your upper body, Patagonia Minimalist Wading jacket is everything you need in your closet for your outdoor sporting sessions. You will love its lightweight feature. -2.5-layer construction of the nylon material adds to the jacket’s thermal properties ensuring you are all warm and dry during all seasons. The breathability rate of the jacket is very high courtesy of the high-quality mesh fabric that allows proper ventilation. Stuffiness becomes a thing of the past. Nylon is 100% weatherproof. -The storm hood is big enough to accommodate braided hair and coverage goes down to the forehead and parts of your cheeks. You can easily adjust it to whichever tension you feel is comfortable. The hood has an attachment that elongates the neck area allowing it to cover up to the chin area making your head area warmer. -Cuffs are adjustable to prevent weather elements from slipping through and affecting your health. On the bottom hem of the waist area, a drawcord if fitted to allow you to adjust the jacket for your comfort. -Four pockets on the jacket, two are on the chest area, one on each side and accessed via strong and durable zippers. These chest pockets are big enough to accommodate fly boxes and other accessories you will need while sporting. The other two are hand warmer pockets accessed via zippers and have their interior parts lined with fleece to add to the jacket’s thermal properties. If your hands are not engaged, feel free to get them warm. -The frontal zipper that runs from the bottom of the jacket to the top neck area is reinforced with a storm flap to enhance its weatherproof feature. -Available in Alpha green color, this jacket can be found in various sizes-small, medium, large, extra-large, and double-extra-large. -Polyester material used makes the entire jacket waterproof making you warm and dry even in winter. The material makes the jacket light in weight allowing you to cast with ease. Construction is breathable and allows air circulation to keep you warm. -Zippers are YKK Aquaguard and do not allow seepage protecting your chest area from cold or any water splashes. The front zipper runs from the bottom of the jacket to the top upper neck. The other is a shorter-length zipper on the bellow pocket. -The hood attached to the jacket is of E-Z design and is lined with fleece and its design fully covers your head and encroaches to the forehead area. -Pockets have fleece liners that make your hands warm. Then two front pockets that are spacious enough to put in your fly boxes and to allow you access your gear easily. In total, the jacket has 6 pockets – two with a flip on the cover two hand warmer and one outer with a zipper to keep it closed and an internal zipper to protect your phone or keys. -On the chin pad of the hood is a liner that retains your body warmth and keeps your temperatures moderate when it is freezing. -The waist area has a stretchy cord that is adjustable in case you want to wear it tight. This is useful to protect your upper body in case you get into deep water. -Sleeves have cuffs that are completely sealed and adjustable. If you want it tight or loose, feel free to set your tension. -D loop attachment point on the back excellent for adding a landing net magnetic point. Fly patch on upper right chest great for putting flies to dry after use or picking your selection for the day. -Available sizes are in small, medium, large, extra-large and double-extra-large size. Customers points from reviews – No zinger attachment points. – velcro on cuffs sometimes catches velcro on top pockets causing problems when casting and you need to check they are both secured properly. – Not lightweight enough to be packable – inside pocket a bit small for today’s smartphones – A bit longer than a deep ading jacket although pockets are held high so shouldn’t be a problem. All these features put together to keep you free from cold and a limited lifetime warranty on this jacket are highlights that will excite you. Mariners and anglers love this warm and comfortable Stormr Typhoon Wading Jacket made of neoprene. While Stormr is concerned about your safety, it ensures its jackets are well crafted to protect you from adverse weather conditions. This neoprene and Fusion Vapr technology employed during manufacturing adds up to its durability. Whether in fresh or salt water, the jacket serves you diligently due to its ability to withstand the harsh environment. -Neoprene material is 100% water and windproof ensuring you remain dry and warm every time. The interior part is lined with fleece which is known for its high heat retention ability. Forget about feeling frozen. -Seams are glued, blind stitched and well finished to make it durable and boost its weatherproofing properties. -The waist area is made with a tight seal to prevent elements of weather that can negatively affect you from slipping through. An adjustable shock cord allows you to tighten or loosen your waist area. -All zippers are weather resistant. The two shorter ones are for accessing the pockets. The longer frontal zipper runs from the bottom to the neck area with ease. -The hood is big enough to cover your head and part of your face protecting you from the wind, cold, rain and splashing water. It rolls over the up collar and doesn’t cause any discomfort. -Two lower pockets one on each side are accessed via durable water-resistant zippers that prevent its contents from being damaged by water. Their interiors are lined with fleece to make it warmer for you when your hands are not engaged. They are spacious enough to accommodate fly boxes and other sporting accessories. -Cuffs on this jacket are fitting enough but not tight. Chances of wind or water getting through to your arms are very minimal. -Sizes available for purchase are small, medium, large, extra-large, double-extra-large and triple-extra-large. The aesthetic aspect of this Stormr Typhoon Wading Jacket will marvel you because neoprene’s quality is unique and good looking. If you spend most of your time fly fishing or working out in the open, this jacket is ideal for you. There is also a camo version great for stalking although it comes at a bit of a price increase over the plain jacket. Fly fishing can leave you with cold-related illnesses due to the frequent exposure to harsh environmental conditions. Being keen while shopping for the best wading jacket allows you get a jacket suitable for your fishing needs. That is why Wright McGill Essentials Wading Jacket is what you should settle for. Artistically designed, you remain dry and warm regardless of how long you spend in the water. -The fabric used is waterproof and integrated with breathable material to allow air circulation when the temperatures get high. The four-layer construction makes the entire jacket durable. With the mesh interior the jacket is good in normal weather if its really cold a fleece base layer is required. -Zippers are oversized and are to allow wet fingers and cold to access the pockets. The zipper area is further covered with an extended waterproof flap to prevent water from slipping in. -The jacket has two big tackle pockets with elastic gussets on the chest area. Pockets are lined with hand warmers and fleece to warm your hands when it begins to freeze. They are big enough to put in the largest fly box that exists. In the interior right upper chest, other pockets to store in your important items are convenient. -Hood is large enough and rolling on is easy. For quick adjusting, the hood has two draw pulls to protect your head area from cold, wind and splashing water. -Fastening is enhanced by the neoprene cuffs that add to the weatherproofing aspect of this jacket. The cuffs used together with Tailwater Gloves from this company keep you warm enough. -Gear pouch in the rear is easily accessible. You don’t have to remove the jacket. Going out in harsh weather conditions is almost impossible until you get yourself the Wright McGill Essentials Wading Jacket. The ability to protect you from adverse conditions yet keeping you warm and dry is one feature that will make you get several of these jackets. Sporting has never been fun when what you have on is comfortable and exactly what you need. Anglers love to spend time at the shows and riverbanks sharpening their skills, having fun or taking part in challenges or contests. While this can get them carried away, they need to be protected from the adverse weather conditions that sometimes are unexpected. Carrying along a Hodgman Aesis Sonic Wading Jacket is just the best thing to do to keep you safe from the cold. -Sonic 2.0 seams are completely taped for aesthetic purposes and most importantly add to to the weatherproofing properties of this jacket. -Arm vents are perforated and Lazar cut to ensure air movement is free and avoid feeling stuffy when it gets hot and you are all sweaty. -Hand pockets are on the lower side and lined with fleece to keep your hands warm. The pockets are big enough to accommodate your fly boxes and other small items you carry along. They are accessed via YKK Aquaguard zippers that are weather resistant to protect what you have in your pockets. Three pockets in total, the upper vertical on the chest area makes accessibility easy. -Cinch cuffs are watertight and don’t prevent water from slipping in. -The hood attached to the jacket is adjustable and big in size. The breathable mesh sewn in prevents it from heating up making you sweat. The hood doesn’t end up stinking. No one needs to tell you the best jacket to buy for a comfortable wading life. Hodgman Aesis Sonic Wading Jacket is simple but ideal for comfort and maximum protection if you love angling. Its simple design and three-layering system is one major highlight you will love. Orvis is concerned about how satisfied their customers are that is why their craftsmanship is unbeatable. This can be depicted from Orvis Encounter Wading Jacket. You will love its lightweight that doesn’t make you feel burdened. Its material allows it to be folded into a tiny ball that can fit in your bag or pocket. Don’t you love its compact nature if you are an angler and on travel? -Nylon material used in manufacturing is totally waterproof and windproof. It is breathable to allow free air movement. The 2.5-layer construction ensures you are warm and dry during your fly fishing sessions. Nylon is easily washable and dries quickly. -Cuffs are adjustable and prevent any elements of weather that can affect your well-being from slipping through. -Drawcord in the waist area is lockable to keep your upper body protected from strong winds, cold, and water splashes. -The hood is adjustable and fully covers your heard from a storm or cold. It has drawcords too for fastening in case the conditions get tougher. -YKK Aquaguard zippers are waterproof and keep you and the contents of your pockets dry and safe. -One pocket only, Orvis intended it to be simple. Sewn-in on the chest area, it is spacious to accommodate sizeable items. Accessing it is through a zipper that is weatherproof. Its interior is lined with fleece to keep your hands warm when resting. -Available sizes are small, medium, large, extra-large and double-extra-large. Nature is unpredictable and weather forecasts are unreliable. To beat all these get yourself Orvis Encounter Wading Jacket to avoid being found unprepared. This jacket is durable from the 2.5-layer material used on it. Being able to be folded into a very small size is a feature that will amaze you. You don’t need to worry about packing space. It can fit in your pocket. The spacious pocket on the chest area is a bonus if you love trendy accessories. Simply drop them in and zip it. Have you ever gone fly fishing in the water with no jacket when it rains? I hope you understand how awful it feels in the end. The negative effect of the fun could either leave you with a doctor’s appointment or down having to take medication. This is the reason you need to arm yourself with a Compass LG Guide Wading Jacket. Always have this weatherproof jacket every time you go out for fishing. The status of your health is fully guaranteed because of the protection it offers. -On the exterior, the entire jacket is made of 100% waterproof material. Polyester, when washed, dries very fast making cleaning and maintenance in case you get in contact with mud easy. The interior parts are made of breathable material for proper air circulation. -The adjustable hood attached to the jacket is big enough to cover your head and cheek areas from the elements of bad weather. On the chin area, a fleece lining is sewn into it to provide warmth to the areas below the chin. It is closed with a press button. -Six pockets are enough to place in your valuables, accessories and fly boxes. The 4 pockets are in the chest area and 2 lower rib hand warmer area – two on each upper sides and one below the upper ones on both sides are accessed by water-resistant zippers. The two side pockets are lined with fleece to keep your hands warm when not engaged. -All zippers have tags that are water resistant to protect the contents of your pockets from damage by splashing water. The frontal zipper is further enclosed with a flap water resistant extension of the jacket reinforced with press buttons. -The shock cord waist is adjustable and allows for adjustment to a tension you are comfortable with. Compass has gone out of its way to design the Compass LG Guide Wading Jacket that is durable and worth every dime spent on it. The lightweight and comfortable nature of this jacket will make you love it for all your water sporting sessions. Proper wading gear is an investment all fly fishing anglers should make to ensure they are safe health wise from the negative effects brought about during tough weather conditions. Frogg Toggs Hellbender Wading Jacket is among the best jackets you can purchase. The Dri-Pore technology employed during manufacture is twice better than plain nylon jackets. -Polyester material used to make this jacket is 100% water resistant and windproof. Breathability is taken care of by the DriPore technology allowing free air movement in the jacket. Polyester is ultralight and dries quickly after a quick wash.
-The hood is big enough and adjustable and fully covers your head. The collar attached to it has an extended bill and can be tucked away. -Three D-rings for attaching accessories like floatant, nets and tools offer convenience. -Designed in a full cut casting manner, the jacket allows you to bend and overhead cast with ease. -Chest pockets are expandable and have drain holds. The four chest pockets have zippered tippets and their interiors are lined with fleece for hand warming. They are spacious enough to accommodate your fly boxes and small accessories. The zippers are water resistant and protect the contents in your pocket from being getting wet. -The frontal zipper that runs from the bottom of the jacket to the neck area is reinforced with a storm flap and has a rain gutter to allow splashing water or rain run down quickly. -The waistband is fitted with an adjustable shock cord for fastening to a comfortable tension preventing weather elements from getting in contact with your upper body. A fold-away rod holder is attached to it for easy accessibility of your fly rod. -Lycra and neoprene sleeve openings are adjustable for watertight casting. Frogg Toggs Hellbender Wading Jacket is durable and will serve you longer with good maintenance. The jacket is designed to have several holders for convenience when fly fishing. You can attach a few accessories to them and easily access them. This is a feature you will love. Style and class are what this Frogg Toggs Cascades Wading Jacket brags about. From a distant look, you can agree that its manufacturer was keen on details to bring out something that has never been in existence in the fishing gear collection. I bet this is a jacket all anglers and sportsmen would love to have. -Material used-polyester-is 100% waterproof and windproof. The ToadSkinz technology used to design it enhances its performance. The interior is made of mesh for breathability especially when the weather gets hot. Due to its lightweight, it dries within a short time. -The hood is fully adjustable and can be folded away if you want your head out. The extended coverage bill offers more warmth to your neck area. -All seams are fully taped and the DriPore waterproof technology lamination adds to its weatherproof properties. -The waistband has a shock cord that is adjustable in case you want it tight fitting at the waist. Attached to it is a rod holder that can be folded away to place in your fly rod for quick reachability. -Both inside and out, this jacket has 16 spacious pockets to place your accessories, items, valuables and fly boxes. They are accessed via water-resistant zippers and storm flaps. -The frontal zipper is heavy duty and is reinforced with a storm flap that is water resistant. -Wrist cuffs are elastic and adjustable to avoid the cold and water from slipping through. You don’t need to look boring when going out for sporting. Frogg Toggs Cascades Wading Jacket is a stylish jacket that does its protective function fully yet leaving you looking executive and striking. The many spacious pockets on it is a highlight you will love because organizing your items becomes easy. You might not need those heavy sports bags when going out. Cleaning and maintenance are easy because after washing polyester dries quickly. Outdoor activities are fun to do and more fun if you are in the right and comfortable gear. Protecting your upper body when taking part in fly fishing is a good thing. Getting yourself the Caddis Natural Wading Jacket means that your health and well-being comes first. The high-quality material used to make this jacket is one highlight you should count on for durability. -Polyester material used in making the outer side of the jacket is 100% waterproof and employ the CaddisDry technology that adds to its weatherproof properties. The inner material is breathable to allows free air circulation. -The fleece collar is thick enough to protect your neck area from weather elements. -Hood has worn in a roll-up manner and its attachment to the jacket if firm. It is big enough to cover your entire head. -Four pockets on the chest area are spacious to accommodate fly boxes and other small sporting accessories or valuables. Two big pockets directly sewn on the jacket are closed with a flap cover that is water resistant. The remaining two are sewn into the bigger pockets and close with water-resistant zippers. -Rear D loop and two front D loops hangers can be used for net or tool attachment. -Cuffs are designed in a cinch up manner to boost its weatherproof aspect. -All the three zippers are waterproof. The frontal zipper runs from the bottom to the top and the other two shorter ones enclose the smaller pockets. Zippers have large pull tabs for easier accessibility. Caddis Natural Wading Jacket in green has perfect aesthetics always making you stylish each time you go casting. Water repellency is among the best features of this jacket that you will love. As you know activity can get hyper when fly fishing and splashes of mud can get on your all-time wading jacket. Keep calm though because you can launder and iron this jacket. Maintaining it as per the instructions on the tag will add to the jacket’s durability. Purchase one and have your upper body protected from the worst weather. Your health and general well-being are important. For water sports lovers like fishing, you need to have your upper body well protected from the cold by having a wading Jacket on. Frogg Toggs TT6405 Wading Jacket is what you as a man needs during your outdoor adventures. -The material used is nylon and 100% waterproof leaving you completely dry. Fully made from breathable material employing the DriPro technology. -All seams are sealed to create an appealing look and enhance durability. -The storm hood is easily adjustable and roomy enough to hold a baseball cap under. The E-Z push method of having it on is simple. -Hem cord locks are sturdy and are in stone color. -Pocket sewed on the chest is made in a box style. it is expandable to accommodate fly boxes and other small things. The inner material of the pocket is made with high-water hand warmer material. Other pockets- some which are located in the waist area are laser-cut and waterproof preventing the contents from getting damaged by water. The jacket has four pockets. -Sleeve openings made of neoprene on the wrist area are fully sealed but adjustable to the tension you feel is comfortable. -The torso area has a zipper that runs from the bottom to the hood attachment. The front has a rain gutter and storm flap to allow water easily run off and not accumulate. -The waistband is stretchy, inclusive of a shock cord and is easily adjustable. -Rod holders can be folded to avoid them getting into your way while in the water. D loop on the back for attaching landing net. -This specific jacket is large in size and designed for men but the Frogg Togg brand has this jacket in other sizes varying from small, medium, large, extra-large and double-extra-large and ripple-extra-large. -Length is 5’6″-6’3″ perfect for all heights. Customer thoughts – Not short for deep wading and side pockets can get water logged if submerged for a period of time – one customer took a dip in the jacket and the gear in the pockets was still bone dry shows pocket zipping is good quality. Wouldn’t want it submerged for a longer time though. Some didn’t like the hood shape saying it caught on the neck. Very lightweight and needs a fleece under when its raining or you will get cold. Great jacket for hiking also. Pockets very roomy and hold a lot of gear. The materials used and craftsmanship employed in designing this wading jacket translates to its durability. You will love this feature of the Frogg Togg Tekk wading jacket. Maintaining your health is among the priorities of this brand. Really fine article and comparisons. I might share that in my experience that Patagonia Tuff Puff Wading Jacket is not waterproof but has a WR treatment and works ok in mist and maybe a light shower but it will definitely soak through. I will say that it is my favorite jacket and those two pockets on the front carry all I need for steel heading. Under a good waterproof wading jacket it is really nice and warm and designed also to not be tight when casting with two handed rods. It is a winner but it’s not a totally waterproof product. Again thanks for this fine review though!!! lots of effort and is appreciated. Thanks for pointing out that error, the jacket is water repellent rather than proof. Used as an underlayer in really bad days but can handle the odd shower. I always see these jackets in movies never knew that they were called fly fishing wading jackets. I also just found out they are waterproof and breathable at the same time. I’m wondering how to wash the wading jackets, does one use the regular anti bacterial home wash? Is it advisable to use this waterproof and breathable wading jackets in a tropical or hot climate? Over all I like the breakdown on the materials used in making it. This article is thorough and i appreciate it. Edwin washing the jacket needs to be done as per the manufacturers instructions on the label. Some are just a gentle soak and leave to dry without any detergent. Others need a special product to first wash and then re-apply a re-proofer. On some of the more inexpensive jackets this would be done probably every season while the top end jackets just need a freshen up in clean water and left to dry with maybe a quick cool iron to bring the gore-tex back to life. Washing these in any kind of detergent or bleach will only break down the protection waterproof layer and make the jacket pretty much useless. So be warned make sure to follow the instructions carefully to prolong the life of the wading jacket. Thanks for sharing a great review article with us. I have seen you did lot of research to bring to us the different variety of these jackets available in the market. Personally have never been to fishing but am sure all these are not limited for that task, they can keep us warm, and dry whenever one is out there on a rainy season. I so love those jackets because they can cover my head and so you do not need an umbrella. These wading jackets are pretty much designed for fly fishing in mind and have the attachments and styled to help improve ones fishing style while fly fishing. However if you wanted to many are now very fashionable and can be worn on the high street or day to day living. I use an old one for dog walking and it keeps me dry from the occasional shower we get here without being too heavy and sweaty. Hi – I’ve been interested in fly fishing for some time, but have not yet tried it. You provide some insightful tips and I will take heed of those when I begin. At what age would you recommend a child starts, bearing in mind the dangers of being in water and the risks that come with crosswinds? I think it would be a great hobby for a family, and obviously when one is starting out to go where the water isn’t too rough. It’s also a great skill to teach a child. The art of knotting could be quite therapeutic too. I’d like to try it with children who battle to focus, it could be a great way of teaching them a skill that captures their imagination and challenges them to a degree . The art of fly fishing itself could help them to enjoy the quieter things in life and appreciate the beauty and connection to nature. It’s a pity there isn’t a wider range of fly fishing wading jackets for women. I don’t recall seeing any of children either, but I will shop around some more. Exactly right, teaching a child to fly fish is a skill they can take with through lifes journey. They may leave it at some point but usually they will come back to it later in life. More tackle boxes and less x-boxes in my thoughts on it. Being out in the open air with a fly rod in their hands waiting for trout to take their fly is great for kids to learn patience and tactics. I have two boys and the younger now just turned 7 is going to get his first fly rod this Christmas. You can start them earlier and thats down to the parent and the child how strong they are and how much patience. For me I wanted to make sure he wouldn’t give up too easily and i think hes about ready now. He has been bait and spin fishing before but this will be a new learning curve for him. As for dangers make sure to wear eye protection, a cap and a long sleeve shirt that should make sure no loose casts get stuck into them and always be mindful on how far they are progressing into the water. For me I don’t do much fishing myself when teaching focusing my attention to them to make sure all is safe. Once they have the basics down then I can do a bit of fishing while keeping an eye. I wouldn’t let them go to the river on their own until I was sure they were fully aware of the dangers associated with the water sport. I remember my first fly-fishing lesson. I got it as a stocking stuffer for Christmas one day. Little about me I loved to go fishing but I didn’t think much of the lessons. Then I finally cashed them in and from the first flick of the wrist I was hooked lined and sinkered. Once I realized the possibilities of being able to cast and re-cast it was a no brainer this was the superior way of fishing. Anyways looks like some quality jackets you have there. Thanks for the reviews. Hey Doc, I know what you mean by being hooked. I do all sorts of fishing, sea, spinning, coarse and game but by far my favorite is fly fishing. Being in a river up to my waist in water casting into a pool where I know fish are lying and waiting for the pull is exhilarating. Hey Mark, how are you? Thank you for amazing and informative article. I never know what fishing jacket to choose, I always buy by the price. Have not bought so many times but always on the look out. If the price is too low, I don’t get, if too high I think is good product, but I don’t get also beacuse I think is overchaged by the brand, so I go with the in between price. Does this make me a horrible fishing jacket chooser? I love the tips you present to us with models, durability, layering, etc so I can keep warm and protected specially in this cold Winter. I think so I don’t need to buy by the price anymore, because now I have your guide that’s will help me to choose the right fly fishing jacket. Telma there are many who buy wading jackets are moved on price, not every one does their coosing on the brand the product technical spec but on how much they can spend on it. For me thats not the best way to do it. As mentioned a few times in the comments a top quality jacket although highly proced will actually save you money in the long run as it will last much longer than cheaper wading jackets. Its more of an investment but I understand not everyone can fork out 4 or 5 hundred on a jacket if they dont have it to spare. I have the feeling those jackets are something you can’t miss, not only in this rainy weather, but I can think about many other situations. I also have a thought: this jacket is not only when you go to fish, also for example, if you want to go to ride a bike in very bad weather, this will also help, no? Anyway, I will show this to my friend the fisherman. Emmanuel you could wear these jackets around town no problem if the weather was bad. They are mostly designed for fly fishing but some are very fashionable too like the Orvis Pro or Patagonia Minimalist. Hey there! How are you doing? I’ve really enjoyed reading this article on “Best Fly Fishing Wading Jackets 2018” as its informative and interesting. I’ve been using Simms G3 Guide Wading Jacket but I wanted to buy another one for my cousin. I’m planning to buy a better one than Simms G3 as I’m giving it as a birthday gift to my cousin. Is the G4 Pro better than the G3? Are there any other extra features it possesses? Hi AV, the main difference in the G4 jacket from the G3 is the materials its made from is ripstop and almost bomb proof resistent. You do get 2 extra pockets as well but the extra tough material is where the extra price comes from. If your budget will stretch to the G4 then I would say go for it you will not be disappointed. The G3 Guide is also an impressive jacket and any angler would be happy recieving one, I know I would. Thanks for sharing a great review about Best Fly Fishing Wading Jackets. I really like fishing however I actually have not tried fly fishing before. I actually have not thought a lot of things regarding the fishing wading jackets before. When reading your post, I’ll positively thinking to select the proper fishing wadding jacket for me. I am going to bookmark your page for my future use. Wow, this is a really in-depth article. It is also super in-depth. I didn’t know that there are such nice jackets out there. When I’ve been fly fishing before, I always end up soaked. I think it’s family tradition by now! It’s great to see there are jackets to keep you dry! Perhaps we can start a new family tradition. A new tradition of keeping dry is a welcome one we think. All the best Rose. Thanks for the detailed and in-depth comparison. Your post gave me new insights and enjoyed reading it. I love fishing but to be honest with you never tried fly fishing and that’s on my list after reading your post and comments section.